I feel like I have been away for a long, long time. Not a peep out of me in ten days, and people are still visiting my blog. Gosh. Thanks to Margene’s post the other day I’ve heard from and found the blogs of some interesting knitters. I have a lot of catch-up reading to do! To answer some of the questions she posed: I’m often attracted to a blog by the knitting content, but the deal is cinched if the writing and photography complements the knitting. I don’t need flashy, and I don’t need literary, but I do want to care about the who and the what (the same way that I want to care about the characters in a book I am reading, because hey, here I am spending time with them…). When I find a new-to-me blog that looks intriguing, I read at least a couple of entries, then I add it to my Bloglines list. When I have time I go back and try to really get to know it. That’s when I’ll read archives, click on links, read the sidebar, etc. I can’t tell you how many times I’ve had an Aha! moment or learned something new just because I clicked on a link in someone’s sidebar! I know I don’t comment as often as I should; sometimes it’s because I’m in a rush, other times I’m just feeling shy or commentless (I’m not a fan of “me too” comments). It’s not from a lack of interest, and I want to be better (or at least more consistent) at letting people know that I read their blogs and care about what they have to say. There are about 70 blogs on my Bloglines list, and several more that I read who don’t have feeds. Because I was away from a computer for a few days last week, I came home to find out just how much the internet and blogging really mean to me — I’m still not caught up at KR, I have only managed to do a quick read of my daily blog fixes, and Queen Bess has given me so much to ponder that I might have to take to my bed to do it! I have been knittin’, though. That’s one of three socks I’ve finished this past week, up there in the arms of the snowy sheep. The yarn is Socks That Rock (surprise!) in Lapis. Delightful, simple knitting. 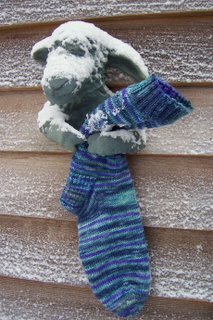 I finished and delivered V’s Sea Socks in time for her to pack them along on her trip to New Mexico. It only took me about two years to make good on my promise to knit her a pair. 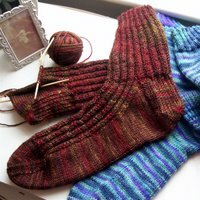 Last but not least, I’ve completed one and a half Woodland Twilight socks. I’ll knit a bit on one, then switch to the other pair for a while, and there’s happiness in every stitch. I have to remember to report my count to Amie for Two Thousand Socks. While I was in Maryland I spent a lot of time on the road, and not as much time knitting as I’d have liked. When I was not visiting my mom I was in the car, and in the area in which I had spent most of my life before moving to Long Island 12 years ago. So I drove around, getting my bearings, collecting my thoughts, and hanging on to all the the shreds of sanity that felt like they were getting away. I stayed at a hotel/conference center that felt more like a college dormitory, but it was peaceful and quiet, and the TV was handy, so I had most of what I needed. For purely therapeutic purposes I visited Yarns International in Bethesda, and there I found some patterns I’d been meaning to order, more DPNs for socks (more needles = more socks-in-progress, you know), and a bit of yarn. It’s a great shop — well-stocked and with a knowledgeable staff — and I wouldn’t mind having it for my LYS. 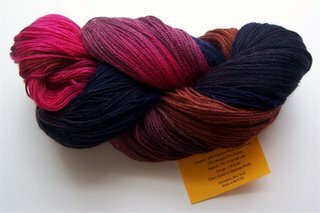 I have been wanting to try a skein of Schaefer’s Anne, and they had this one gorgeous, perfect skein in stock: I don’t think it wants to be socks, though. I think it would prefer to be the Diamond Lace scarf from Heartstrings. Hmmm…another one to add to the To-Knit List! Thanks to all of you who have made me feel so much better through your comments and support. My mom is just beginning to “come out of it” — the post-anesthesia/painkiller fog is just awful for people her age and in her health situation — and she’s beginning to benefit from physical therapy. She is being cared for with more compassion and gentleness than I thought was possible in a nursing home setting, and I’m grateful for that. Seeing her and knowing she is getting good care helped relieve some of the stress that has been plaguing me and my jaw. There’s a lot less clenching going on! I’m happy to be back at home, and it seems that Miss Annabelle is glad to have me. On with the sock knitting, then! Your socks look great! I’m glad to hear that your mom is doing better.I love Anne yarn. I just finished knitting a lacy scarf from it and (by weight) I still have plenty left over for a pair of socks – so you might be able to do both scarf and socks! I also spend alot of time online.. looking into the windows of other people’s lives without leaving a comment b’c a meetoo seems too little to say.But I enjoy your enthusiasm and am always glad to see that you have stopped by 🙂 hugs!love all the sock knitting you are doing and I am VERY glad to hear your mom is being well cared for. more hugs! We’ve missed you, Jane. Your thoughtful posts always give me something to ponder. Yes yes – I am so glad you are back and glad to hear your mother is being well cared for. I drool over that beautiful Anne yarn. but in the most generic way – for I’m still flush with enthusiasm for my stash delights. Show it to me a few months from now, though, and I may sulk. I’m also glad to hear your mom is better. Thanks for the Bloglines comments, I need to get better about linking my blog up and setting up a list for myself. HOw wonderful that your Mom is improving.. I always enjoy reading your blog – and the photos are always faulous.Your new socks are so great!! Love the colorways!